Joan is a part of the 2018 graduating class at Uhuru Academy. Joan lives in a two-bedroom home near Naivasha with her parents and three siblings. Joan has seen doctors mistreat people, especially those in poverty, and she is determined to become a doctor who is humble and kind to everyone. In her free time, Joan enjoys running and is a member of the cross-country team. She says that she gains strength, energy, and encouragement through running. Joan loves Uhuru Academy, because unlike at other schools, the teachers take time to talk and encourage students personally. She believes that parents can teach certain things, but students need experts (teachers) to teach subjects like physics and biology. Her teachers have inspired her to pursue her dream to become a doctor. 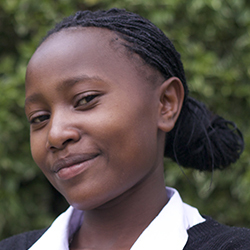 Click here to sponsor a student like Joan.